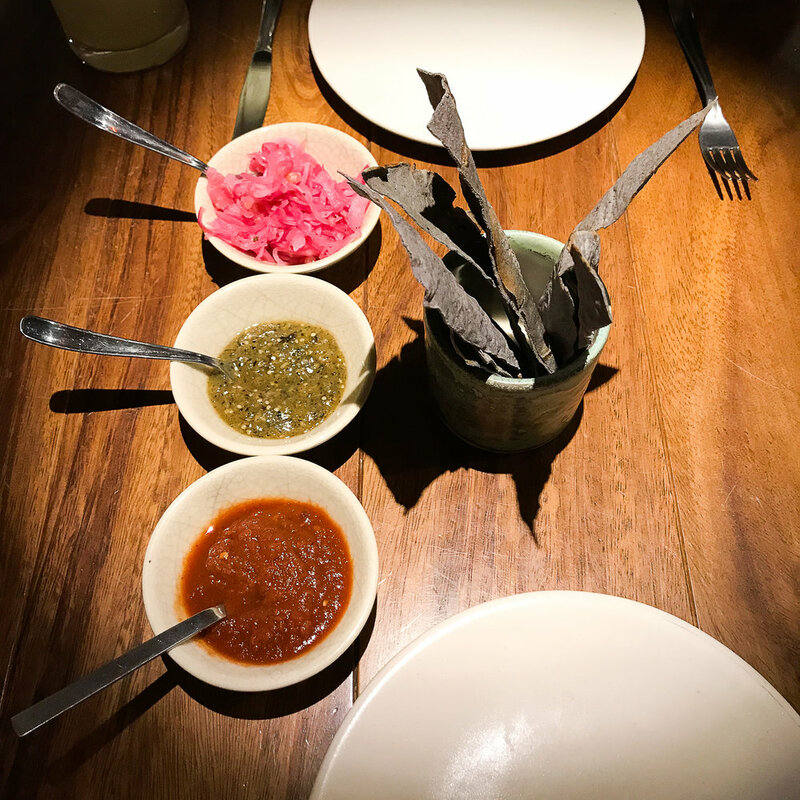 Two weeks ago I shared with you my food experiences from my last trip to San Miguel de Allende Mexico in February. 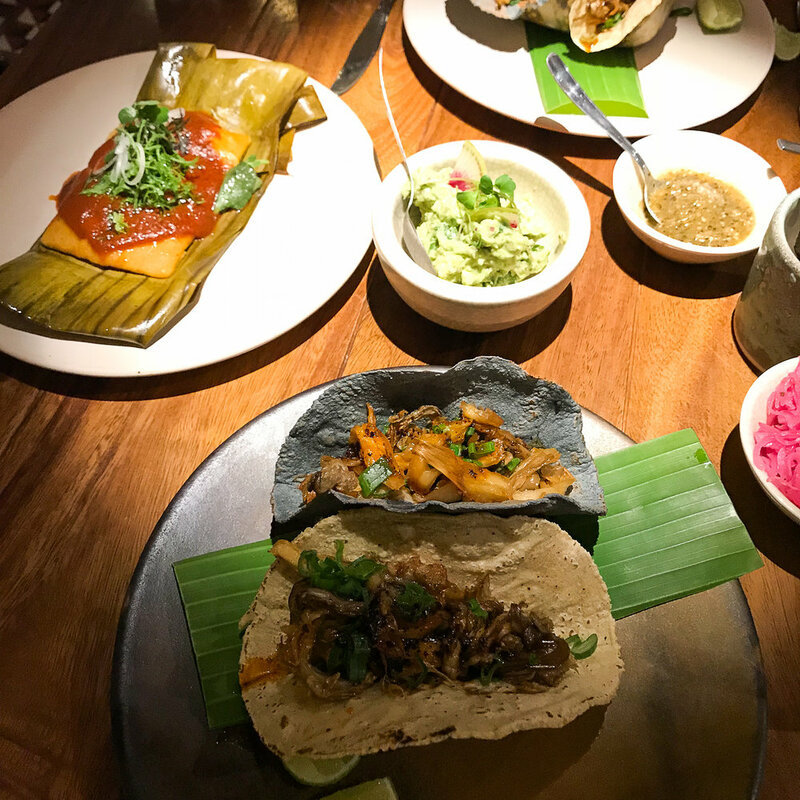 Today I'm giving you a peek into everything we did there, and maybe it will inspire you to have your own adventure...perhaps even in Mexico. This was my first time ever staying at an Airbnb, and it was the best experience ever. I've seen my friends post pictures of their cute Airbnb rooms when they travel, and let me tell you, that yes, these places can really look as cute as pictures! We stayed at a place that was about a 5 minute walk south of the main square. It was a perfect distance because we could start the day with a little walk on our way to get coffee. The hosts were wonderful, and we even got to know one of our neighbors and peek into her room. (third photo). We had a shared living room space, a kitchen, a garden, it was so inviting. I highly recommend it for a trip, and it will keep the cost lower. A few blocks from our Airbnb was a pop-up flower market. I heard it was only there for the month of February, and then the space converts back to a little park. Last year this is where I would go running in the morning, so I was pleasantly surprised on my first day there when I saw this flower market set up. It smelled so good, and they had so many plants available varying in size. There was an area dedicated to selling clay pots for the flowers you buy. On the first day we were there, it rained. The whole day. It was a bummer since we had hoped to spend our time in the sunshine, but this was a good day to go to some museums. My favorite one is an art museum near the center that is also an art school. It has beautiful murals, a courtyard, and a few featured artists displaying their work. When it's sunny, I like to sit in the courtyard with a book. There are so many little boutique shops all around the town. So many. Everyday I went and discovered new shops selling art, ceramics, wooden creations, clothing, jewelry, home goods, pretty much everything. The level of creativity and talent in this town is so great. There's also a pretty large mercado that stretches about 8 blocks with little booths along each side, AND down the middle. At one end there's a food market where you can get fresh fruits and vegetables, as well as meats and spices. At this end there are people cooking food, so you can sit and eat a snack or a meal. Then as you make your way down you can buy pretty much anything else you need with so many options. The Mexican culture has strong roots in the Catholic religion. There are so many beautiful cathedrals and churches in San Miguel and they're all breathtaking inside and out. You're able to walk in and see the inside when there isn't a mass happening. I love to sit for a little bit and take in the grandness of the church building. It brings back so many memories from my childhood. San Miguel de Allende is a very artistic town as a whole. From all the handmade items that you can buy in the small shops, to the north part of San Miguel where you can see a whole collection of wall murals as you walk the streets. As you turn the street corners in this area, you're greeted with inspiring paintings. It's amazing. There's also an old textile factory that has since been converted to artist studios and galleries, small shops, and restaurants. You could spend a whole day in this area enjoying all the art. Los parques, or the parks in Mexico are little areas that are surrounded by trees and might have a gazebo in the middle. Seeing statues are also a common thing. These are really just spaces where families can hang out together enjoying the fresh air and street life. You'll usually see people setting up their little stands to sell things or food carts ready to serve up some treats. The main park in San Miguel is right next to a church so if you're there in the afternoon on a weekend you'll probably get to see a wedding parade. I wrote about the wedding parade a few months ago, being a popular tradition where it's like the whole town is invited to the celebration as the wedding party and guests follow mariachis and a wedding donkey around the square. It's such a fun experience. The parks are a great place to hang out any time of day. There's always something interesting happening. This last trip was a bit rainier and cooler than I expected, but I had a great time. I took great pictures that I'll be revealing in the summer with a new collection. I ate way too much food, and drank an excessive amount of coffee. I know I'll be back to San Miguel, hopefully with my family, but I'd also love to plan a trip where it's kind of a retreat for people who want to come along. I'll keep mulling it over and thinking through logistics, but if you're interested leave a comment or send me an e-mail to let me know. I love this city, and I know anyone else who comes will too. I visited San Miguel de Allende, Mexico for the second time last month. The first time was for a photo workshop where I ended up falling in love with the city. This time I brought along a friend to explore with me. Lovely is a wedding florist in Chicago that I've known for the past 4 years. She was so nice to come along with me this time around. 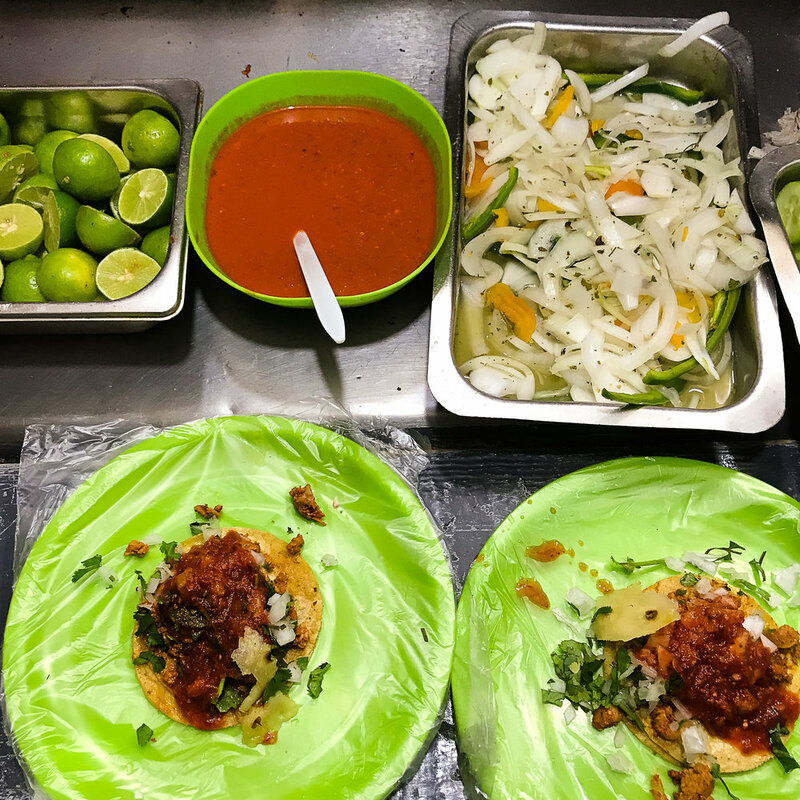 One of the best parts of visiting Mexico is the food. 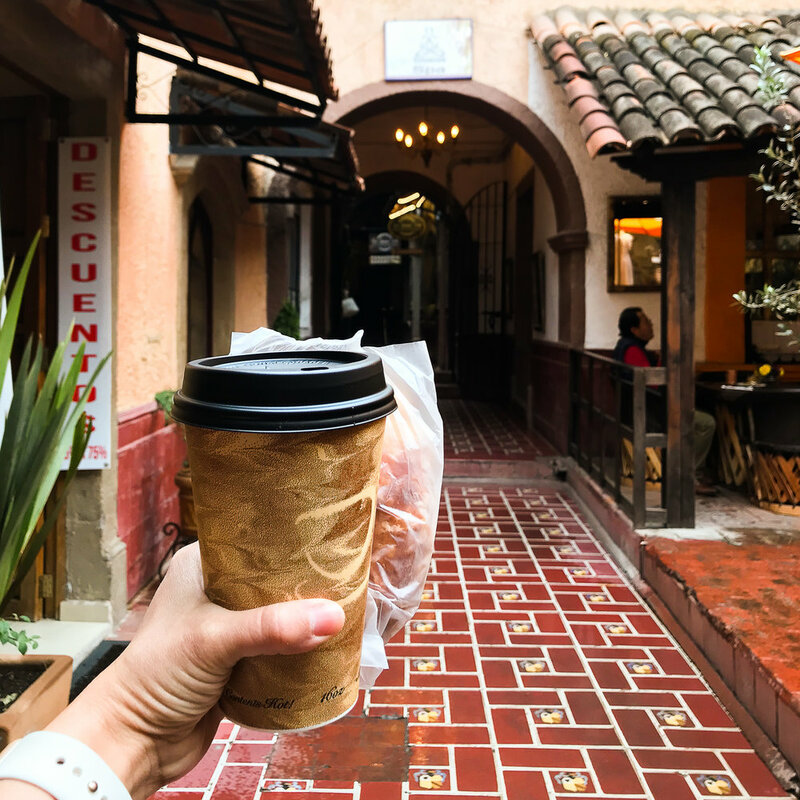 I want to give you a little glimpse of some of my favorite cafes and restaurants in San Miguel de Allende. Let's start with cafes, because knowing the best coffee spots is the most important part of a trip....at least it is for me. This cafe take up a little corner point of the street. The cafe is triangle-shaped, with a fountain outside, so it's hard to pass up. This was our regular morning coffee stop. I would get a latte and a pastry to start the day. Their coffee tables were amazing. Coffee beans and dried flowers made the coffee lover and florist happy. This is also where I get my coffee beans to take home. Their roasting is so good. Whenever I can, I try to have yogurt and granola for lunch. It's just so good in Mexico. I haven't been able to find better yogurt anywhere else. Café Contento definitely has great yogurt, and I know they will never disappoint. They also serve toast with jam and "nata," (the cream from the top of the milk) which is amazing. We came here twice on our trip. This cafe is next in the arts district, and right next to a huge art gallery called Fabrica Aurora. When we visited the gallery we came to Geek & Coffee for lunch and coffee (I'll talk about the arts district more in another blog post). They serve really great sandwiches and quiche. Lovely got the veggie quiche and I got a veggie sandwich. 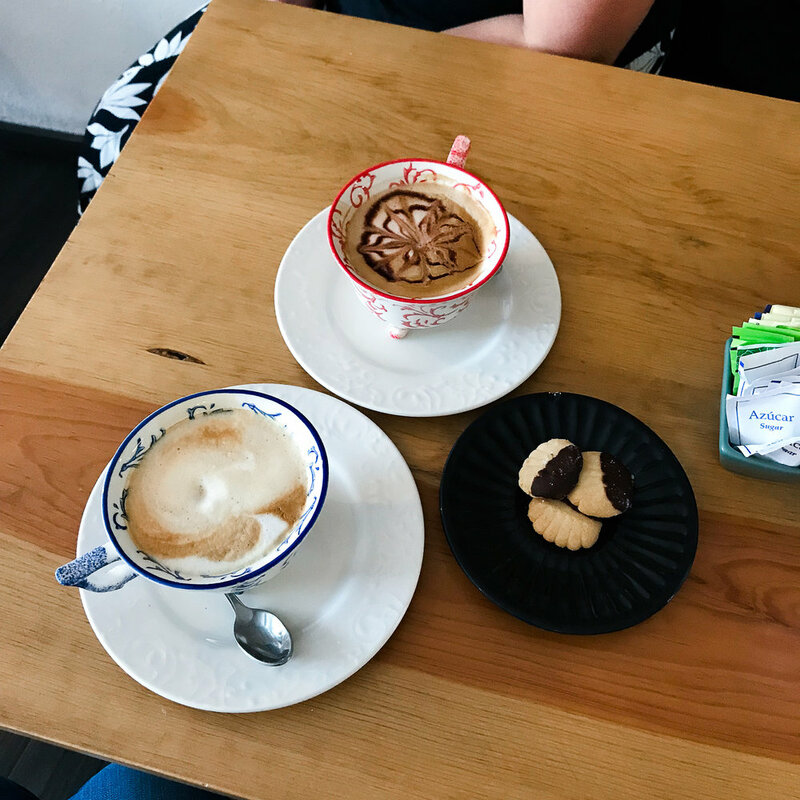 After walking around in Fabrica Aurora we came back to post stories on Instagram and drink a latte. They really do make amazing lattes. The third day we did a lot of walking around. I was taking pictures all morning and wandering around. We met a little north of the square near a mercado at Buen Dia Cafe. 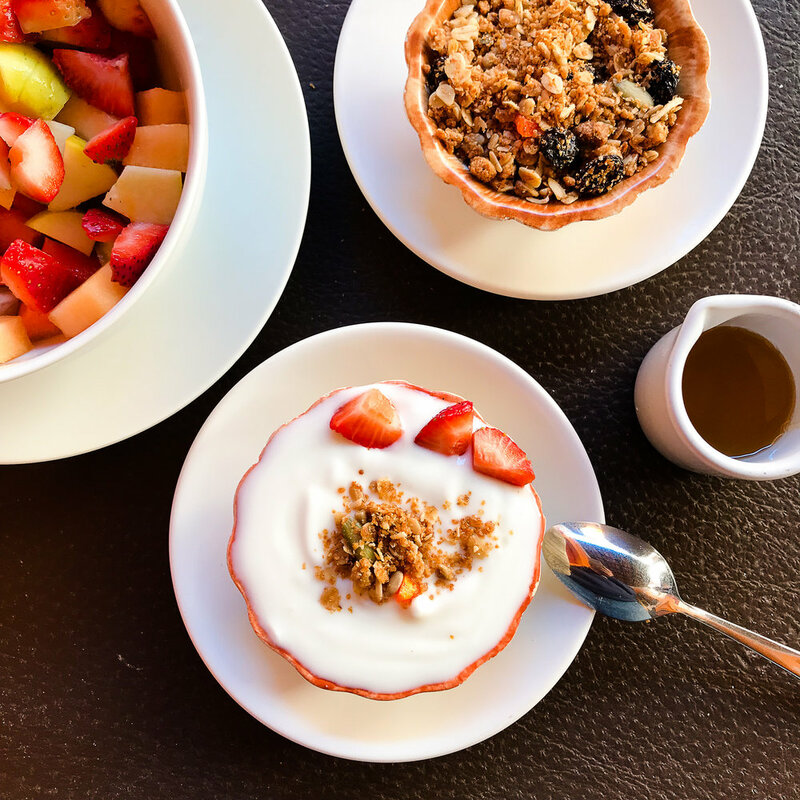 This is another cafe I can always count on serving great yogurt and granola. At this point I'm sure Lovely was understanding my obsession with yogurt and granola and my need to track it down. Their lattes are also really great and pair well with my late lunch. There are a few other places we stopped for coffee, because why not? We arrived at our Airbnb pretty late our first day. After a whole day of travel all we wanted was a drink, and dinner. Hecho in Mexico was across the street from where we were staying and I remember it being good from my last trip. I ordered a paloma and fish tacos with fries. It was an amazing first meal. Lovely had scheduled a taco and tequila tour for us the second night. Our plan was to go to 6 different places. 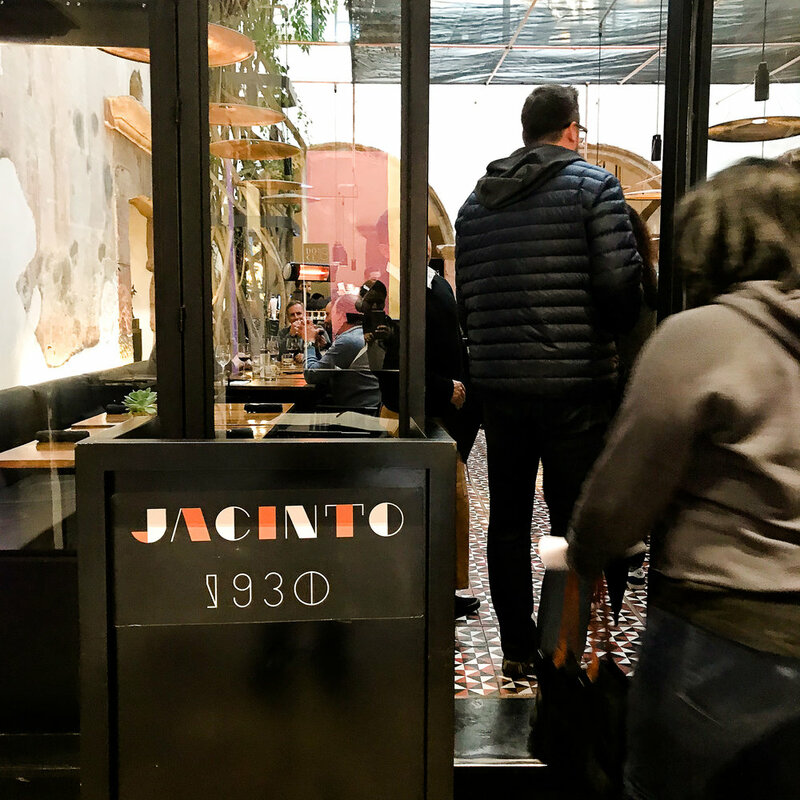 Our first stop was Jaciento 1930 where we were given their mushroom tacos paired with a grapefruit margarita. I have never had vegetarian tacos as good as the ones here. 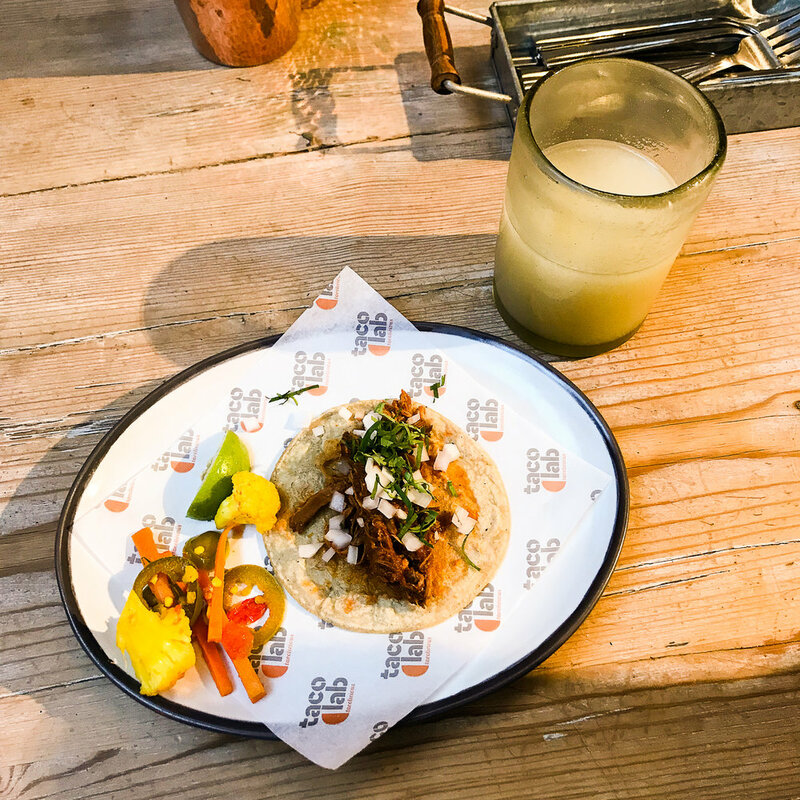 Our second stop was at the Taco Lab. This is where they test out taco recipes to then sell in California at their restaurant; that is if they do well here. This was paired with guava juice. I don't like guava, but the chicken taco was really good. Next we when to Baja Fish Taquito. It was raining, but that didn't stop us from dining on the roof under umbrellas. We got a fish taco and a special beer from Mexico. I drank that beer so fast it was so good. We walked to our next stop Salon Oxacaca. Here we actually got a shot of Mezcal. Tequila is thought to cure the flu because it kills bacteria, and when you chase it with either orange or lime you get your vitamin C. At this point I didn't argue and just kept drinking. I even put the special salt on my orange which was really spicy crushed up worms. By now, I was like everything is great! Haha. They served it with a pizza-like taco that we shared. Our last stop was at a famous street cart called Andy's Tacos. His name is Andres, but a foodie who was visiting San Miguel stopped for a taco and ended up putting Andres on the map as a place to eat and called it Andy's Tacos. We ate as many tacos as we could here. There was no liquor but his tacos were so SO good. I had several. After our taco splurge we walked to the corner bar Cantina El Cucu, for our last paloma. I was too distracted to take a picture of my drink, but trust me, it was good. I'm so glad we did this tour because it gave us a chance to try different restaurants and get some history of the town. The couple we toured with was also so nice. They were great company, and our tour guide Jean Pasccal was the best. You might recognize this place from our taco tour. This was our first stop, but we had to come back for those mushroom tacos. They were just so delicious. 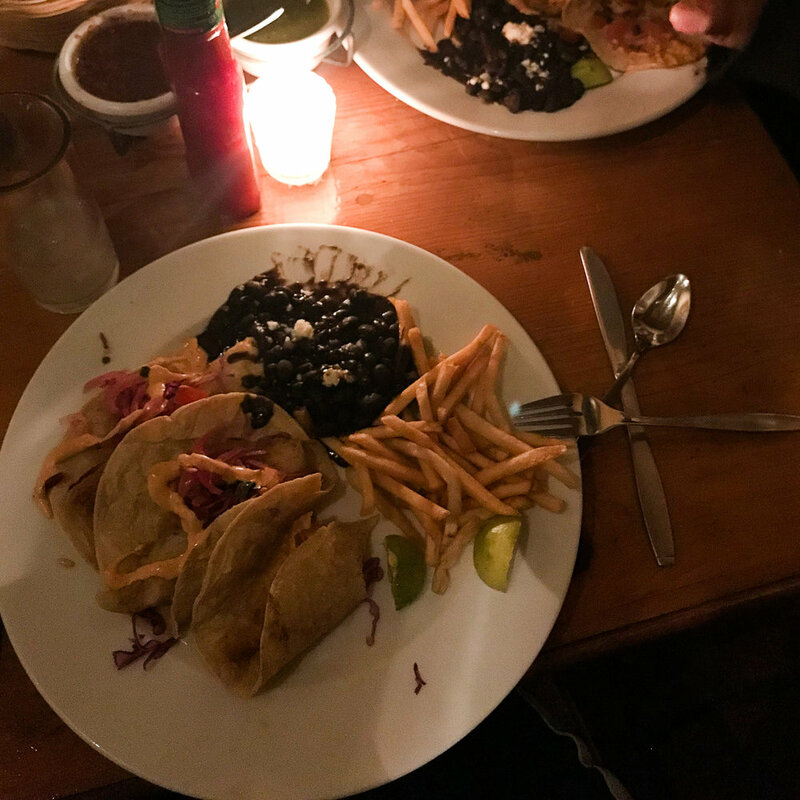 We also ordered a chip appetizer with two different salsas, pickled cabbage, and guacamole. I ordered a rib tamale along with my tacos. I also drank rosé...two glasses. I regret nothing. This was our last dinner in San Miguel. 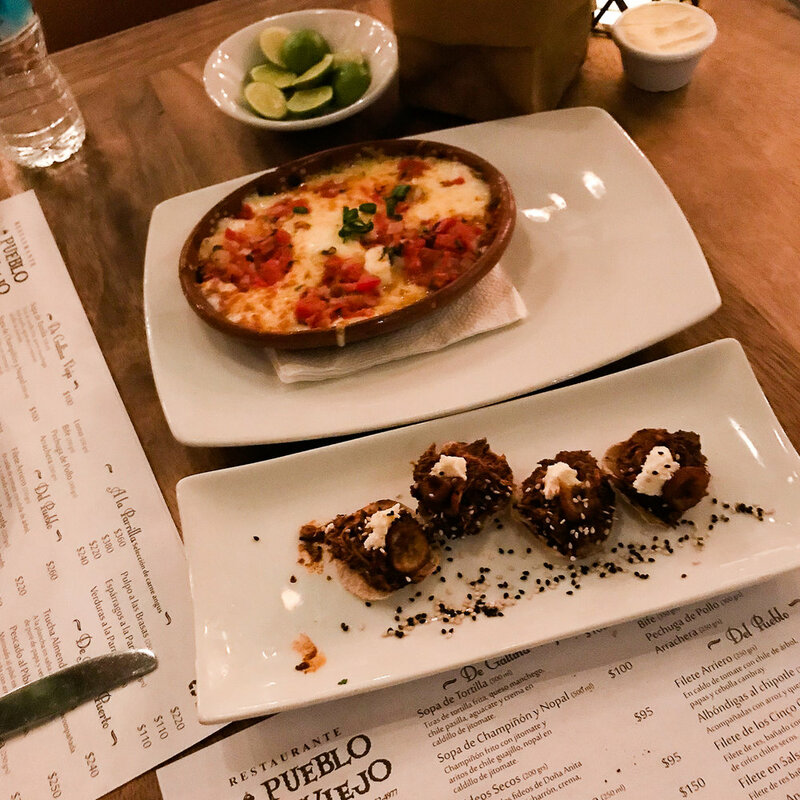 I dined at Pueblo Viejo on my first trip, so I suggested coming here for a meal. By this time, I felt like i had been eating, like, the whole trip. We did queso fundido with chorizo and steak plantain chips for an appetizer. I had a garden salad for my meal. I felt like my stomach needed a break, but I'm glad I snuck the appetizers in there before the salad. Haha. The food in Mexico is SO good. And San Miguel has over 400 places to eat. It's a very foodie kind of town. I have all the recommendations on where to eat in San Miguel. There are some places that we didn't get to visit this time that I'm saving for my next trip. But these are some of the top places to eat. Let me know if you have any questions! I'm always happy to talk food, coffee, or about Mexico in general.